Year of appearance: 1645. Height: 170 meters. Area: 360,000 sq. meters. In Lhasa, the Tibetan amidst the scenic mountains of the famous Potala Palace — the highest of the oldest structures on the planet. Palace is located at an altitude of 3767 meters above sea level, the location of the palace hill top of Marpa was chosen Ri. The Potala Palace is the largest monumental structure in the territory of Tibet, it occupies the whole top of the hill and its slopes. The height of the layered construction is also quite impressive and is 170 meters. 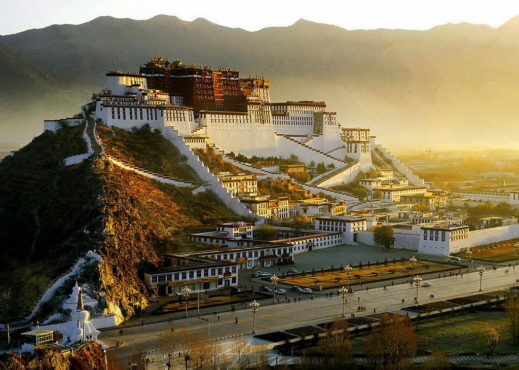 Potala — complicated palace complex, which in addition to the royal palace itself includes massive temple complex. The total construction area of 360 thousand square meters. meters, for many years the palace was the main residence of the Dalai Lama. For Buddhists, the Potala Palace and today is of great religious significance, and a wide range of tourists it is known as an interesting museum. According to historical records, the construction of the palace complex was started in 1645 under the leadership of the Dalai Lama, the V, three years later, the construction of the White Palace was completed. So far, the architecture of the palace complex is considered to be unique, it is an incredible combination of numerous buildings, steep stairs and terraces. Not surprisingly, for the construction of the palace in the 17th century have been invited to the best craftsmen from Tibet, China and Nepal. Visitors to the palace will be able to stroll through the spacious pavilions to look into the living quarters, which once belonged to mentor and regent of the Dalai Lama. On the territory of the palace complex is the famous cave of Fa-Wan — an important Buddhist attraction.